I can’t hold it in! Cagen = let-down! Boyfriend and I sushi at least twice a week, usually one to two “every day” sushi-yas, and then one “fancy” sushi-ya. This week, CAGEN was supposed to be our “fancy” sushi. 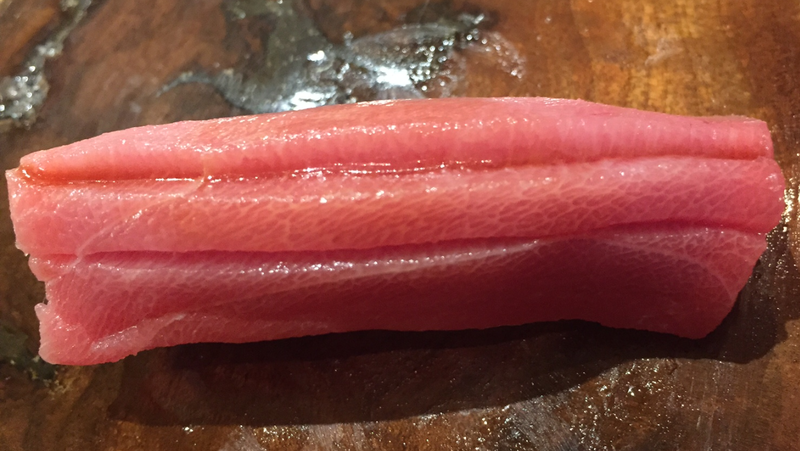 Well it wasn’t fancy, but at $140 as the base price on the omakase, it certainly can’t be considered an every-day sushi-ya. There are some good parts. 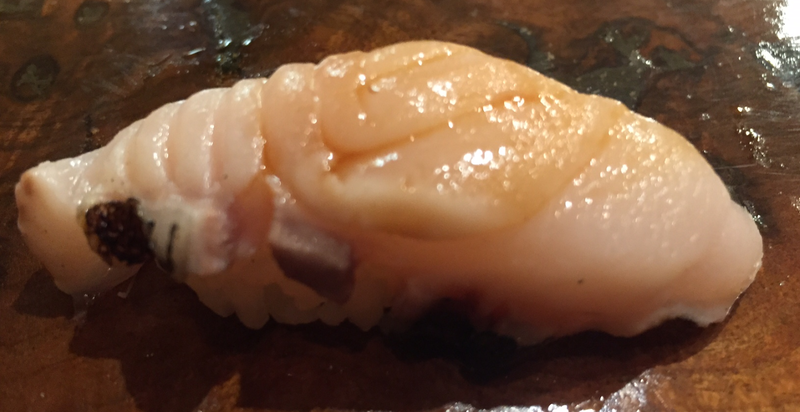 This quaint little sushi-ya is tiny, has a traditional, warm, heavily wood-surfaced interior, which I love. Who am I??? 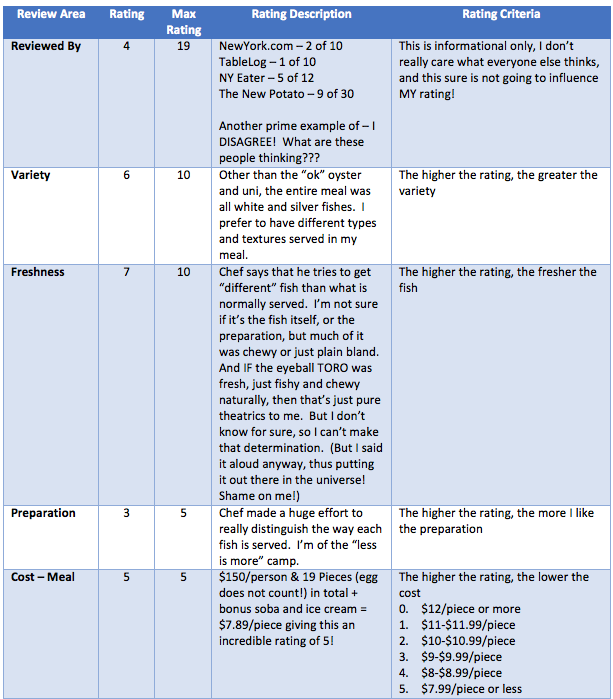 It’s a sad day when I describe a sushi restaurant, and my first “favorable” point, is interior design. What the heck do I know abt interior design? Notice, I haven’t commented on folks interiors thus far, why start now? If anyone wants to know about décor, or atmosphere, Google it, you’ll find a million pictures that will answer that question in just a few clicks, way better than I can with paragraphs upon paragraphs. Picture is worth a thousand words? So corny! Continuing with the good, I’d like to say that the staff was not at all pretentious, though the other patrons seem to be! Am I in the Upper East Side and I don’t even know it? Do you ever sit at a restaurant, and can hear loud and clear, the ENTIRE conversation that the persons in the next 4, 5, 6 seats are having? No, it wasn’t the restaurant acoustics, it was just loud people. We heard in detail, the business plan of three twenty somethings, and the retirement plan of a sixty something. I don’t force you to listen to my conversation, I don’t make it a volume competition, so why are you forcing me to listen to yours? So obnoxious! I continue to deviate, let’s get back to the real topic at hand, the food. 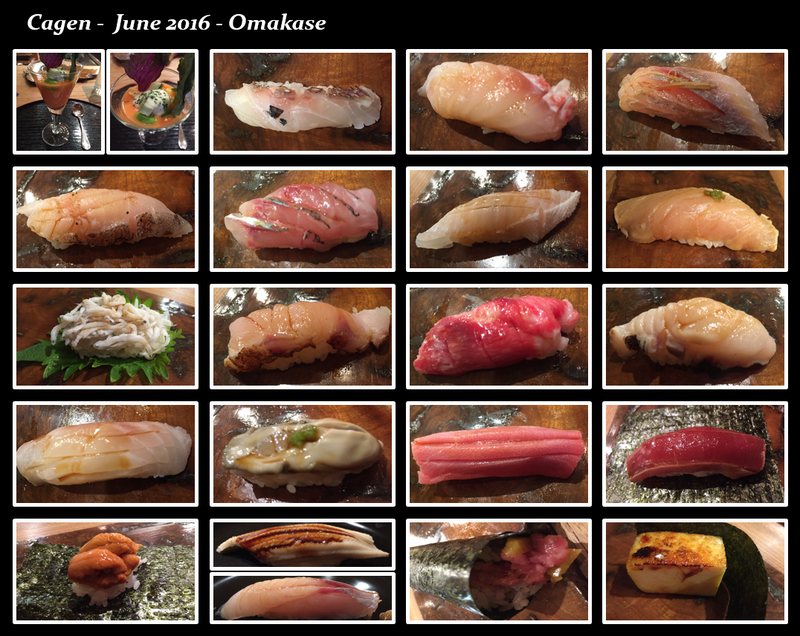 The sushi bar serves omakase ONLY, which I appreciate. It’s quite irritating when you are at a prized sushi bar seat, and the lady next to you orders a chicken teriyaki. We arrived roughly 30 minutes early to our reservation, but they seated us anyway, thank goodness! It was sweltering outside. Note that I consider anything above 70 to be hot, and above 75 to be sweltering. Back to topic! So not immediately after all. 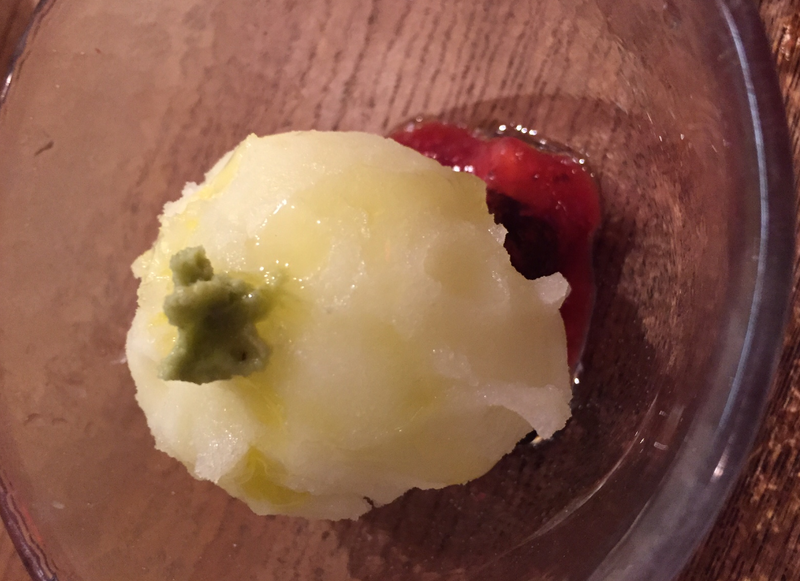 There was an amuse bouche. 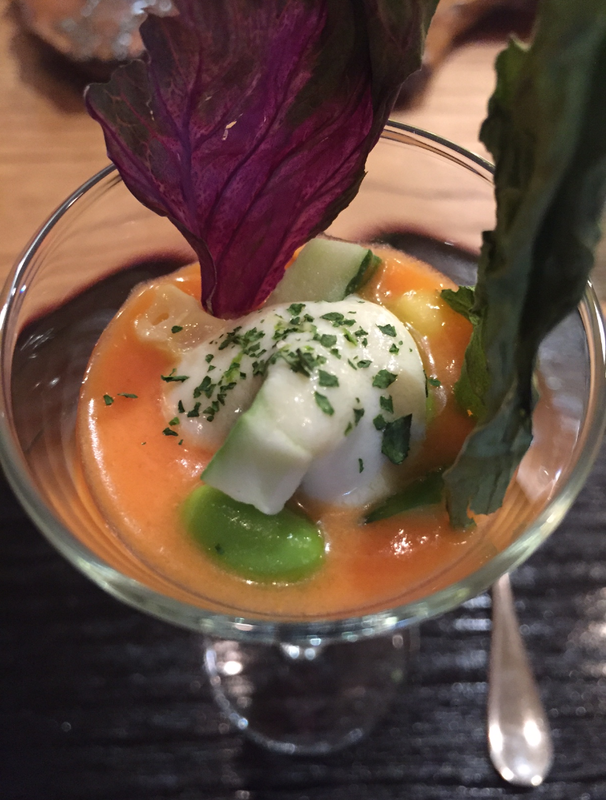 It was some “chea” seed (don’t know what chea is, or if it’s even spelt right) gazpacho, topped with tofu mousse, edamame, and dressed with kale and custard green crisps. Sorry, I gave this, THREE honest spoonful tries, I couldn’t do it. It was NOT good. It was not great, but good enough. It’s my first piece, I’m not going to judge it THIS early. Difference between TAI and MADAI? 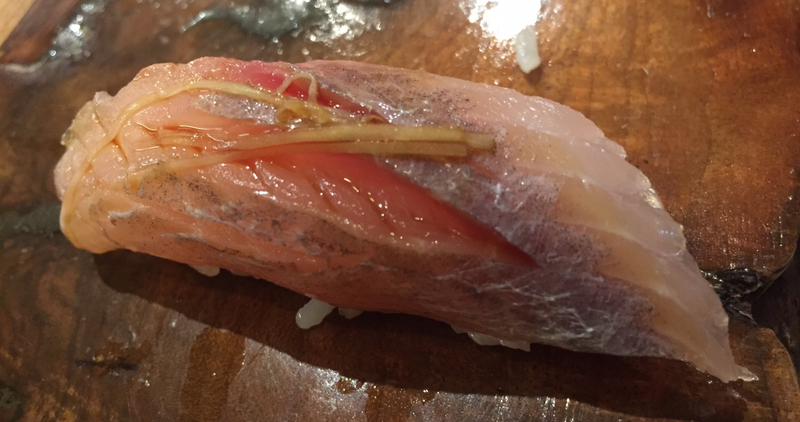 TAI are red-snappers in general, while MADAI is a true seabream. 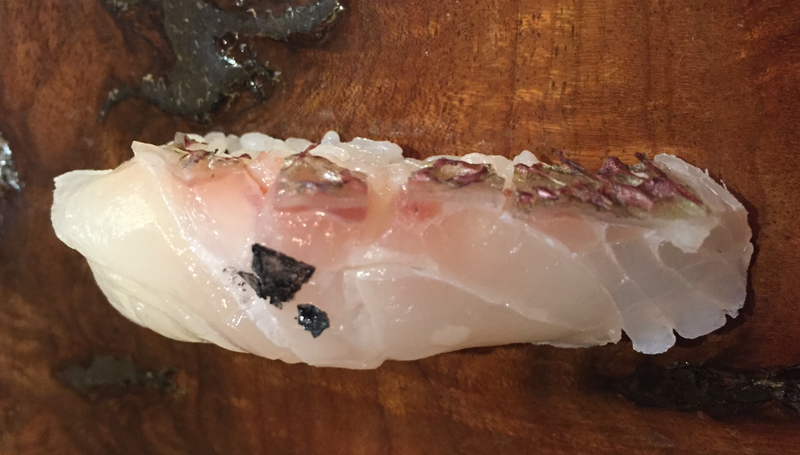 If you are offered either-or, always pick the MADAI. 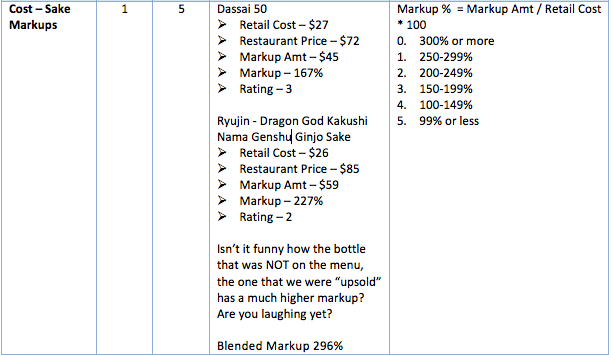 Another spoiler alert, MADAIs were not served at all during this Omakase. 2.2. KURODAI – Sorry, I’ve reverted to my old ways, just chowing down the moment the fish is presented, and missed my photo opp. It was served with a shaved Jalepeno. Verdict? Despite the Jalepeno, this was bland as heck! 2.5. 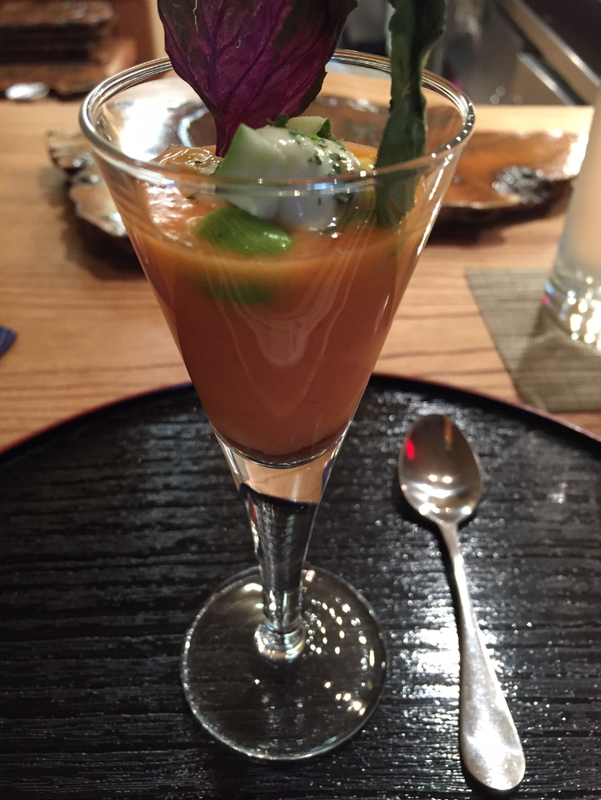 KARASU GAREI – It was serve ABURIed, first piece I really enjoyed. There is hope! 2.6. AJI – Hope continues! The second piece that I thoroughly enjoyed, but why so thinly cut? 2.7. 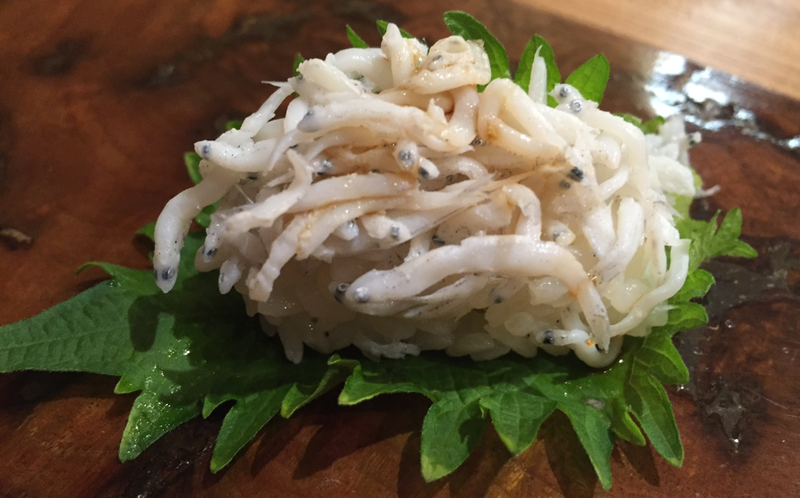 ENGAWA – Served with crispy garlic. This was the first time I had fried garlic with my ENGAWA, while still very tasty, I definitely prefer it served the traditional way, either ABURIed or not, with a splash of lemon juice, and a sprinkle of sea salt. That said, can I have a big bowl of crispy garlic to go? There’s a movie I’d like to watch, and this would be a fantastic compliment. I’d like to crunch away on these goodies, and just BREATHE on the boyfriend. Yes, more of our 12-year-old, ridiculous humor. 2.8. 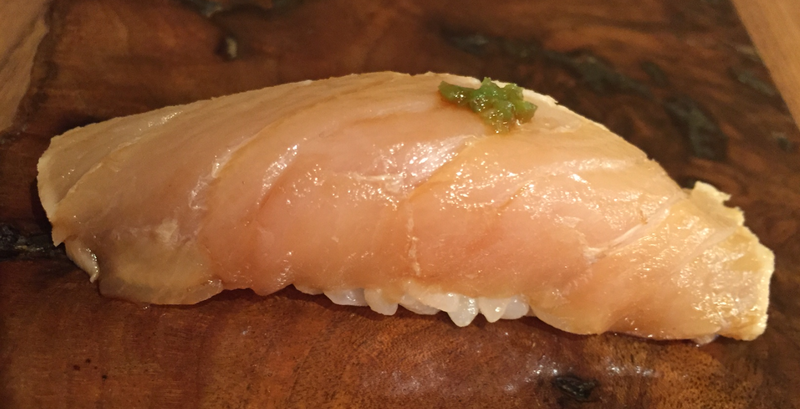 HAMACHI ZUKE – Served with Jalepeno topping. 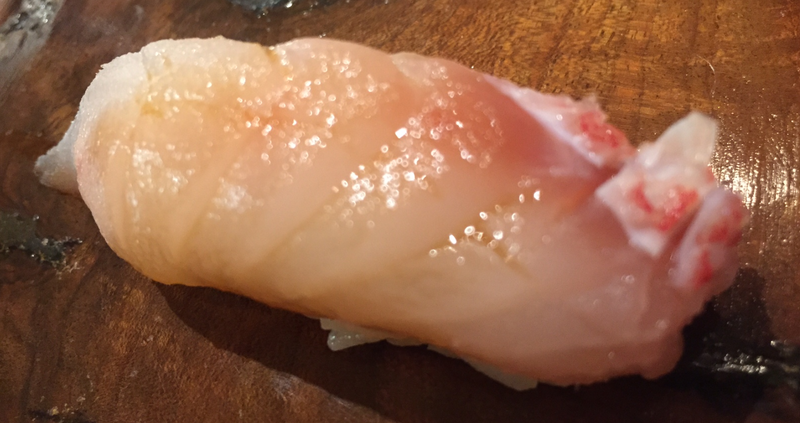 I’ve never had my HAMACHI ZUKE-ed. Way to dress up an otherwise undesired cut of fish for me! The good streak continues! 2.10. 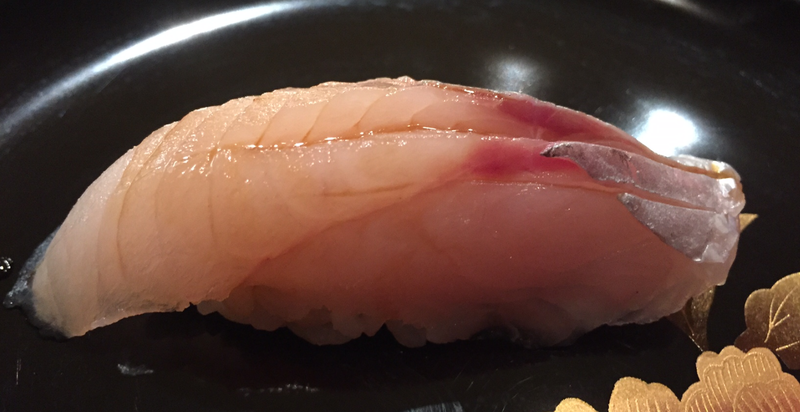 NODOGURO – NODOGURO is a type of AKAMATSU. 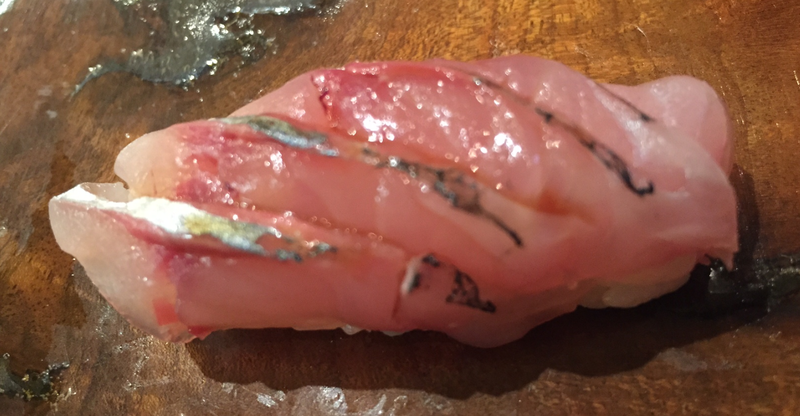 AKAMATSUs are one of my favorite white fishes, but this one was less favored. It was served slightly ABURIed, good, but not great. 2.11. 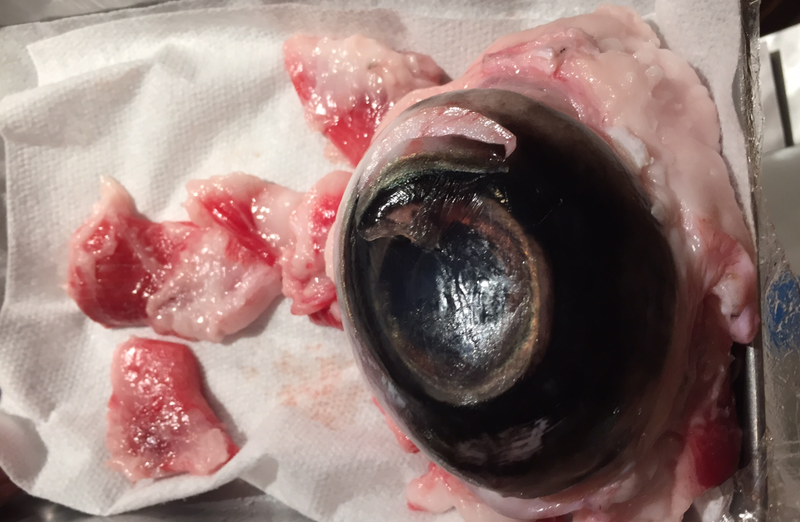 TORO – This was cut from the muscle behind the eyeball of the Tuna! This was another first time for me. 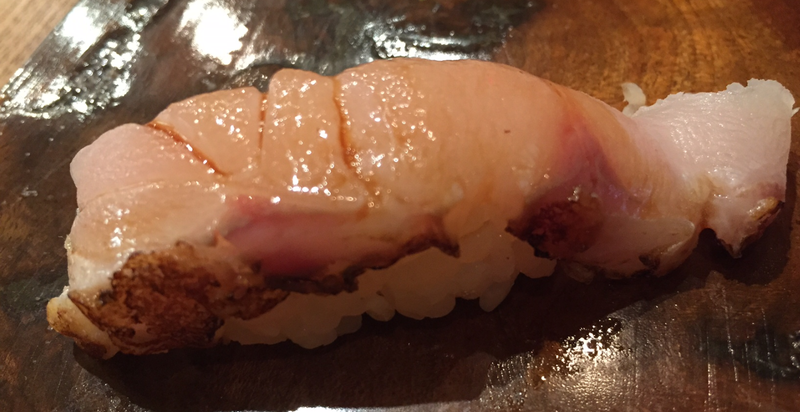 It was a crunchier, fisher version of the traditional TORO. 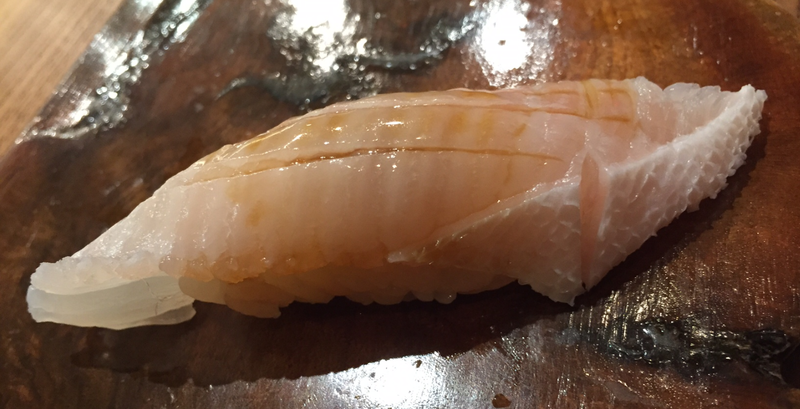 Because it was my first time, I can’t tell if it’s the quality of the fish, or the cut. 2.12. Scarecrow fish? I have never had this, never heard of this. 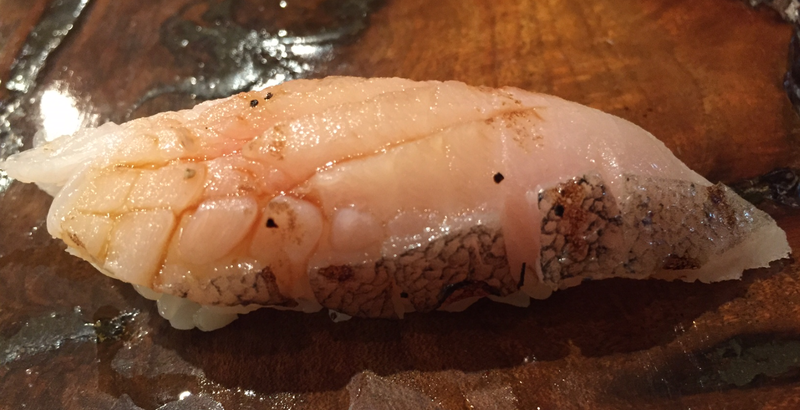 It appears to be a white fish, served slightly ABURI-ed. It was good, but nothing extraordinary. 2.13. ISAKI – At this point, the chef was super busy, and did another drive by only. 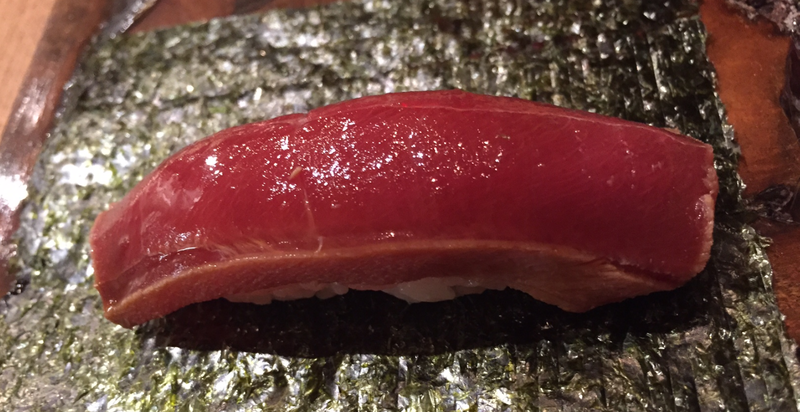 I BELIEVE this was an ISAKI, it certainly tasted one. 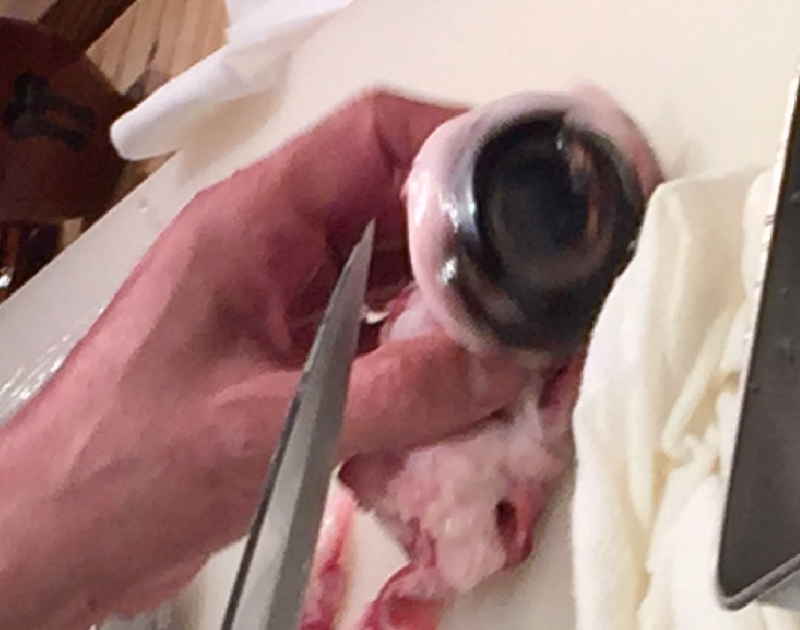 It was served with another crispy garlic beneath the fish. Unlike the ENGAWA, where I preferred it without, this one, I liked with! More crispy garlic please! 2.14. 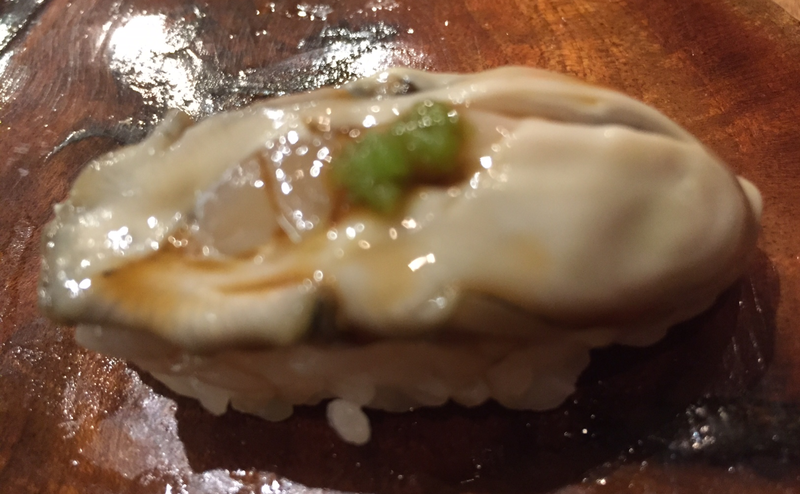 KAKI – Kumamoto oyster. It was good, but not great, and I prefer oysters served in the shell. The rice takes away from it. I also wished it was served with a little something-something, and not just plain soy and wasabi. 2.15. 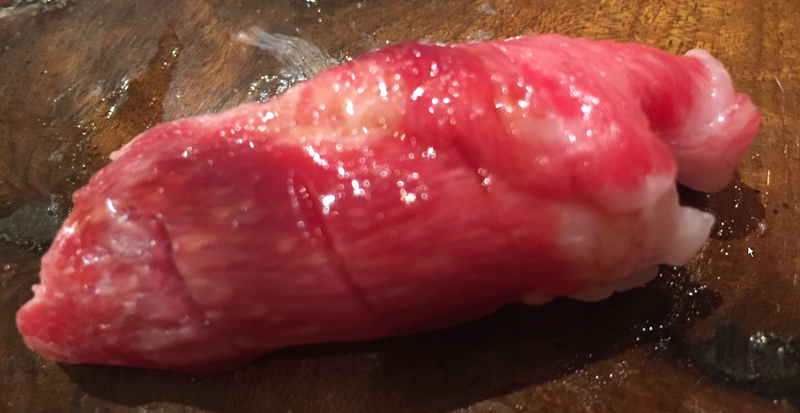 CHUTORO – If this was the same Tuna as the eyeball TORO, then yes, let’s stick with traditional TORO from the belly! This was a non-chewy, non-fishy cut. YUM! 2.16. 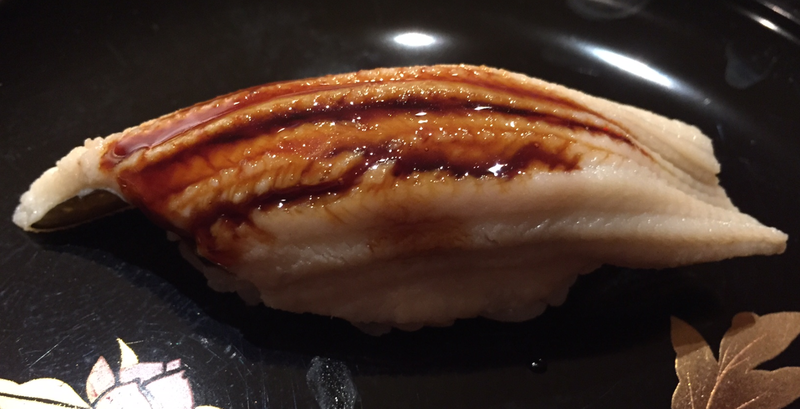 AKAMI ZUKE – Served as sushi, atop a toasty NORI. AKAMI ZUKE and CHUTORO are two of my favorite TUNAs. YUM! 2.17. 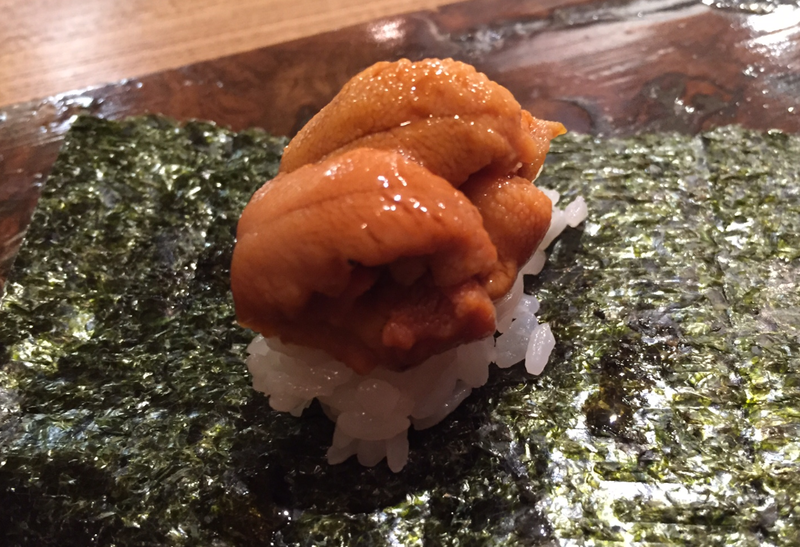 HOKKAIDO UNI – It’s not prime season for HOKKAIDO UNI, good, but not great. 2.19. 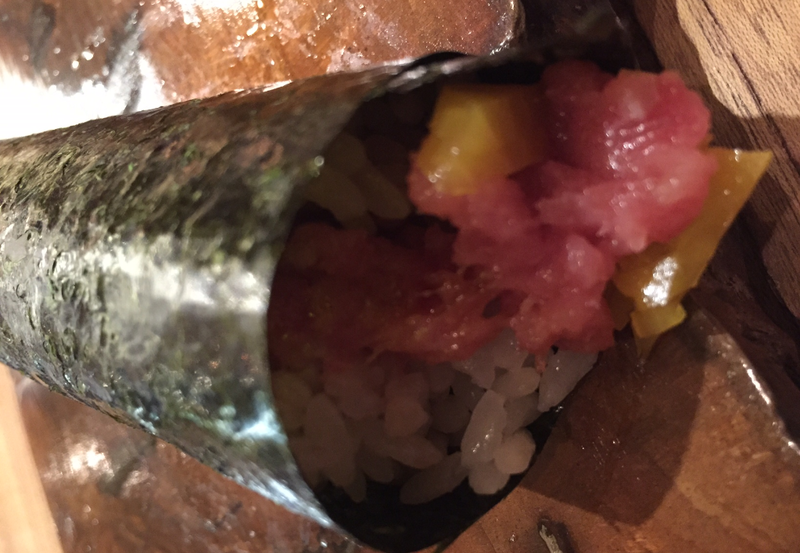 TORO with TAKUAN (pickled daikon radish) hand roll – This was good, but this was one of the leanest TOROs I’ve ever had! 2.20. 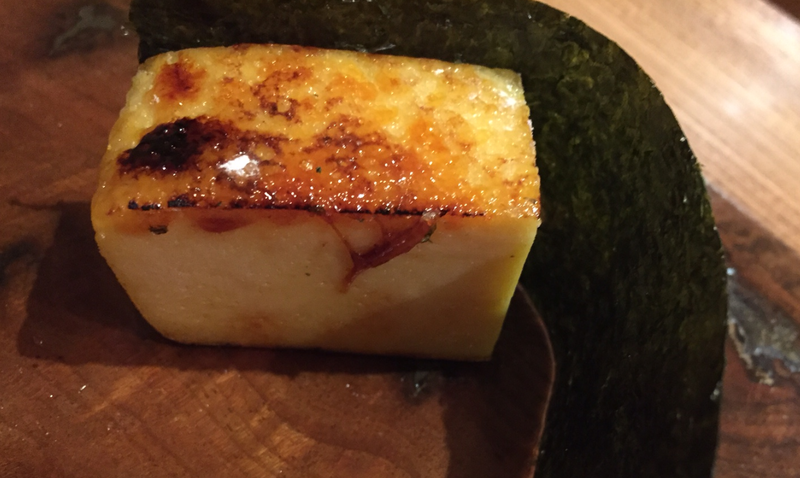 TAMAGO – WTF? Why am I getting egg with my omakase? I should have specified no eels, AND no egg! 3. SOBA with MOUNTAIN YAM – GROSS! 4.1. 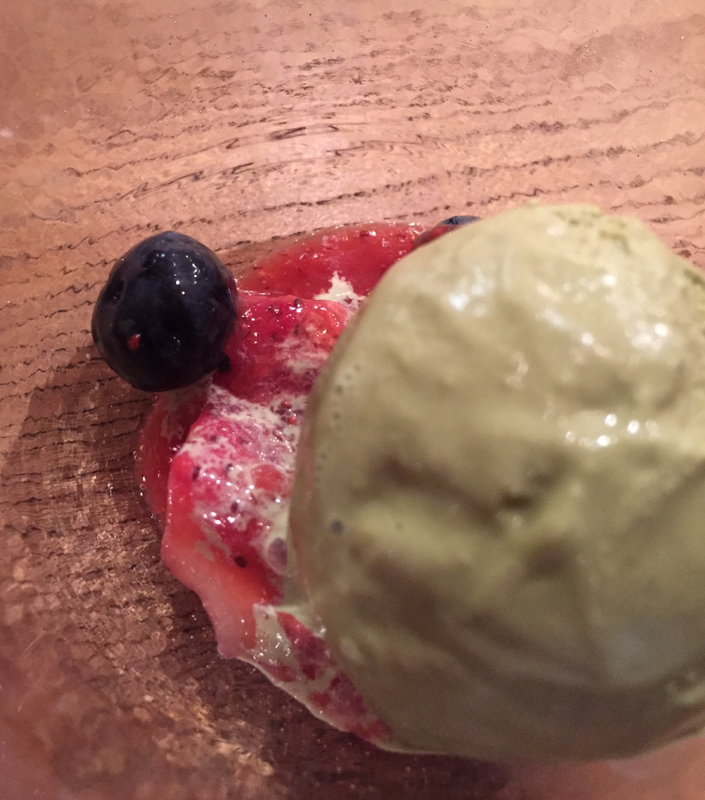 Green tea – Boyfriend really enjoyed this, but I found that the berry sauce fought against the mild green tea flavor. 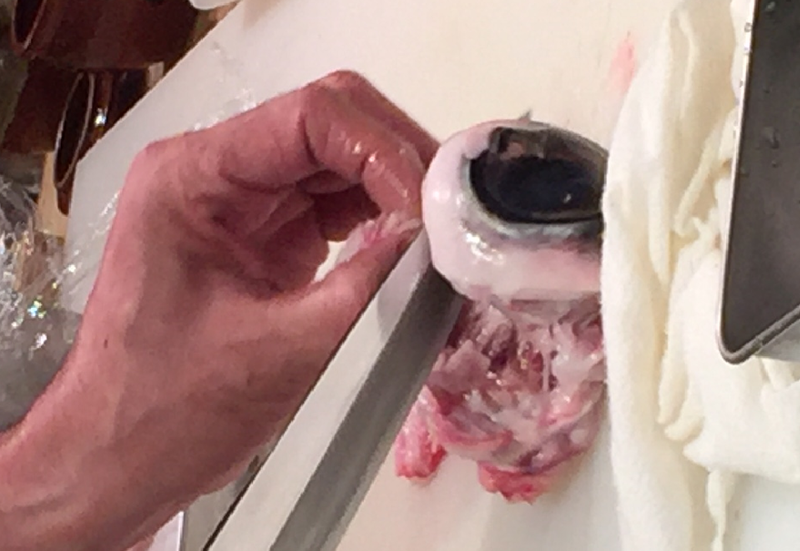 Perhaps it should have been served with a sweet red bean paste/soup like it traditionally is? 4.2. Yuzu – Here, the sweet berry sauce definitely complimented the crisp almost tart YUZU flavors. I ate the WHOLE thing, which is very rare for me.